June 16, 2017 August 25, 2017 - by HAHAPPY - 6 Comments. Find the Best Star Wars Gifts For Men at HahappyGiftIdeas.com. Star Wars Fans always love to receive gifts that are either cool, funny, practical, or collectible. 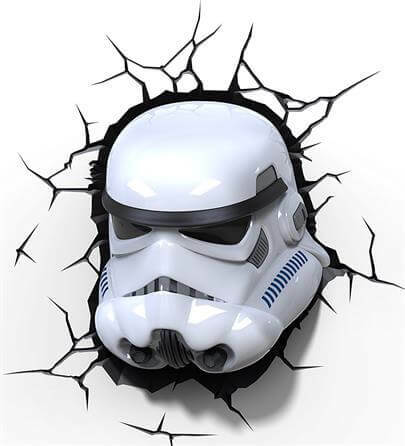 So, we have revealed our 27 Greatest Star Wars Gifts to help the Force be with your loved one – from Star Wars Electronic Helmet to 3D Storm Trooper 3D LED Wall Light, Villian Star-Fighter Bluetooth Speaker, Luke Skywalker and Princess Leia Statue and some much more. Read on to see our picks. If you’re looking for star wars gifts for boyfriend, search no more. 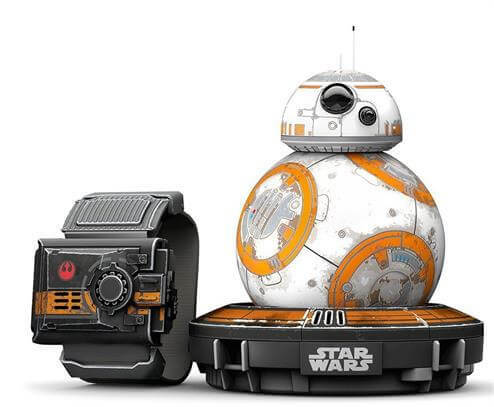 This Star Wars™ Battle-Worn BB-8™ and Force Band™ by Sphero fulfill every Star Wars Fans’ destiny and become stronger in the power of the Force. 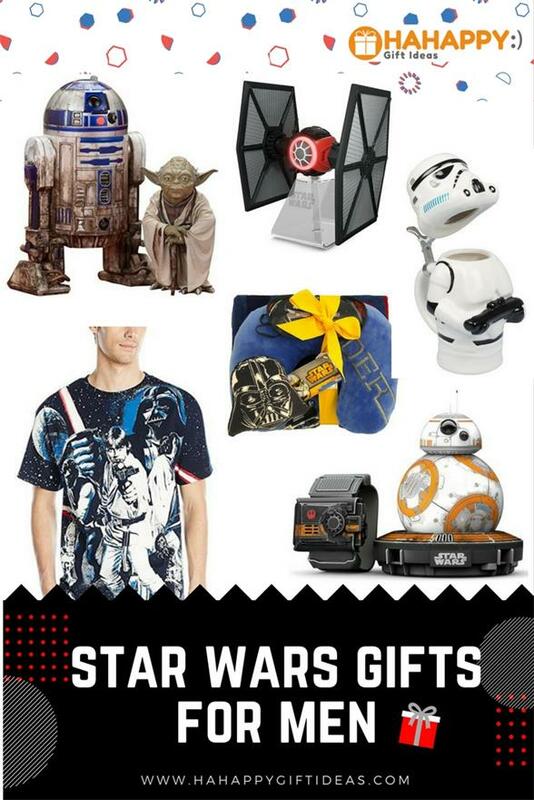 Searching for Star Wars gifts for men? Look no further. 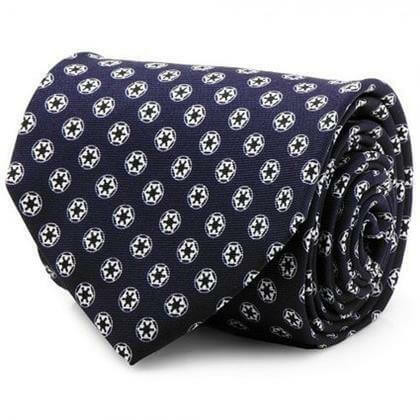 This 100% Silk Navy Blue Star Wars Imperial Empire Neck Tie helps every Star Wars gentlemen dress up in a stylish Star Wars style and is fully operational for their formal outfits. If you’re looking for an exclusive Star Wars gifts on Amazon, then you’re going to want to put this into your shopping cart. 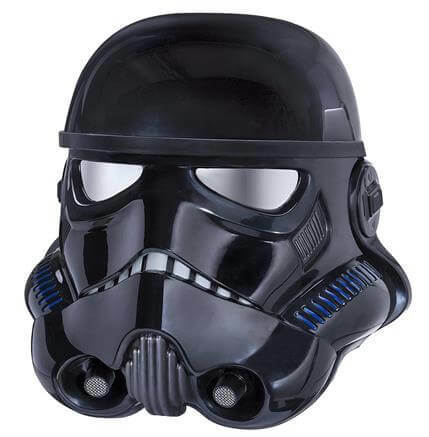 This authentic and highly detailed Star Wars The Black Series Electronic Helmet features activate the internal microphone for voice effect. Looking for Star Wars gifts for dad? 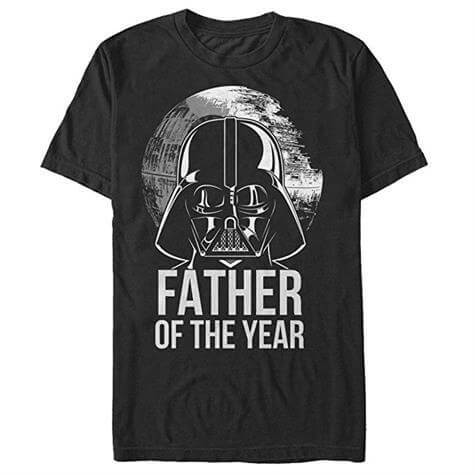 Give this funny Star Wars Darth Vader Father of the Year T-Shirt to your dad in the Galactic Empire! It is made of 100% Cotton and printed with eco-friendly inks. 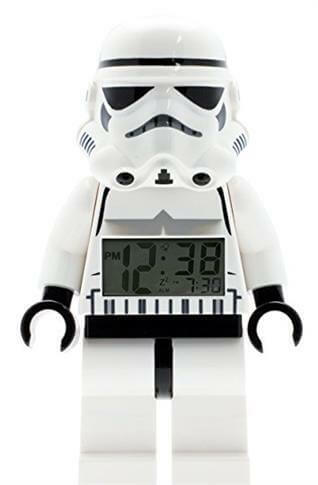 Wake up every morning with this great LEGO Star Wars Storm Trooper Mini-Figure Clock. This 8-inch tall figure style clock features a lighted digital display and alarm clock, makes a great addition to every LEGO Star Wars collection. 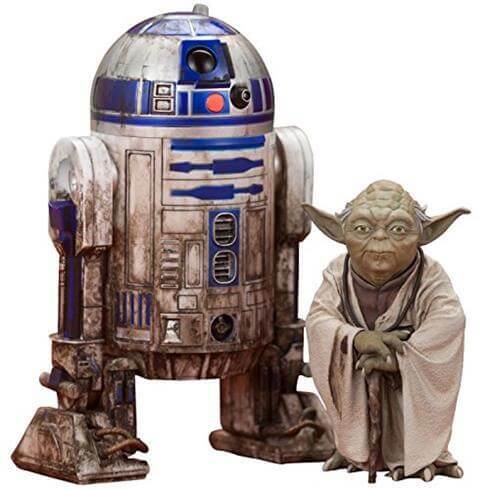 Bring Yoda and R2-D2 to life in dynamic 1:10 scale statues, and they look like just stepped right out of the Star Wars Universe! Perfect gifts for Empire Strikes Back fans and a great addition to their ARTFX+ Star Wars display!. It’s time to pamper the Star Wars Lover in your life and help him cross over to the dark side. This incredible Nixon Men’s Vader Black Stainless-Steel Quartz Watch features a custom dial inspired by Darth Vader’s ventilation mask with Miyota Japanese movement. 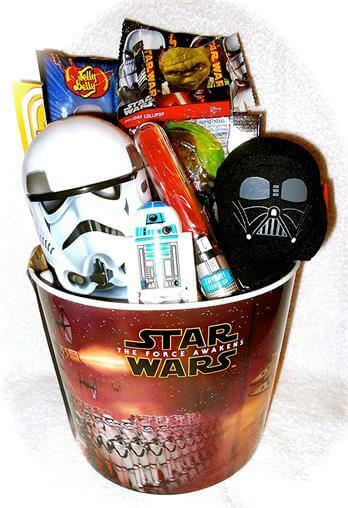 This Fun Filled Star Wars Gift Basket will really WOW any Star Wars lover! It includes Star Wars Movie-Night Popcorn Bucket, Star Wars Gummie Candies, Star Wars Coloring Book Set, Star Wars Puzzle, and much more Star Wars STUFF! This limited-edition Star Wars Pen Gift Set captures the spirit of three great characters of the Star Wars film. Fans of Darth Vader, the Stormtroopers, and C-3PO. 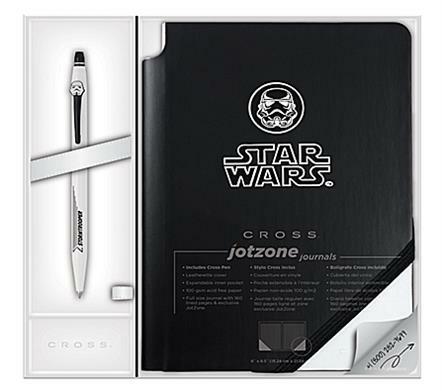 Star War Fans will definitely love to have one of these gel pen sets and companion journal at hand. These sets are sure to spark big ideas across the galaxy. 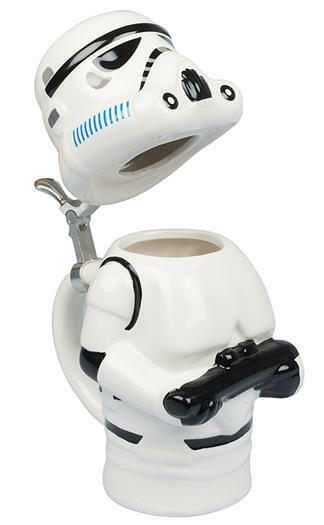 If your loved one is a die hard Star War Fan through and through, bring Storm Trooper into his/her room in a new way. This cordless, decorative LED wall light looks like to break out of the wall with a funny 3D effect. 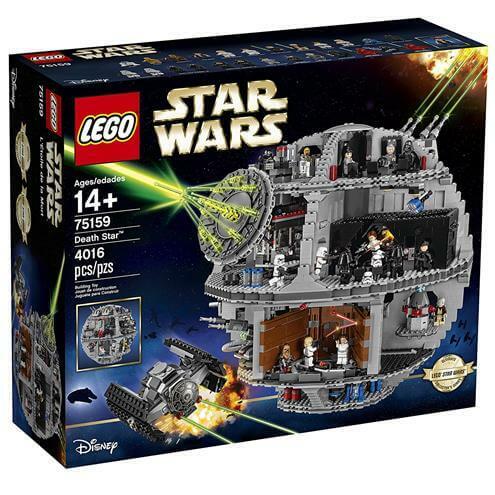 Made for the Super Star Wars fans who want to recreate the unforgettable scene from the movie, this ultimate stocking LEGO Star Wars Death Star 75159 set includes over 4,000 pieces and 23 iconic mini figures to ensure hours of Star Wars battle fun. 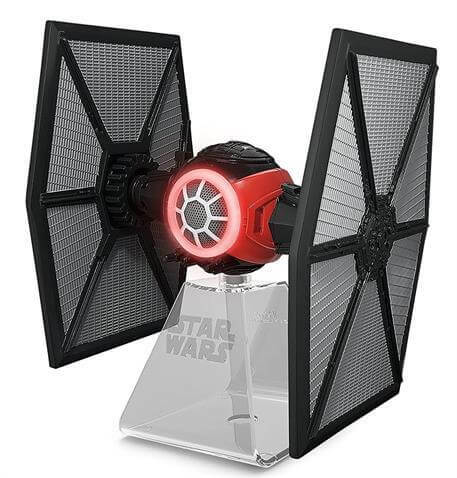 This awesome Star Wars Villain Starfighter Bluetooth Speaker lets any Star Wars fan enjoy their favorite music wirelessly anywhere up to 30 feet with powerful sound performance. What’s more, the speaker will glow in the dark within use. 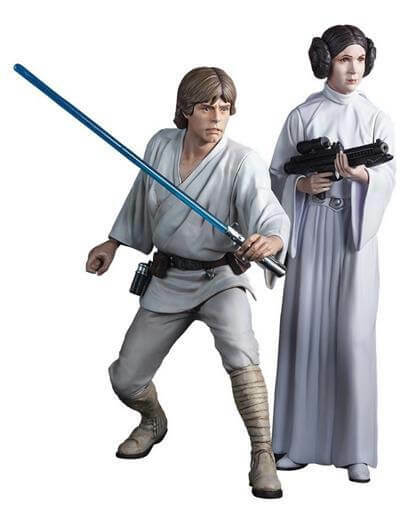 Feel the power of dark with Luke Skywalker and Princess Leia. These statues were sculpted base on their appearance in the original STAR WARS film A NEW HOPE. 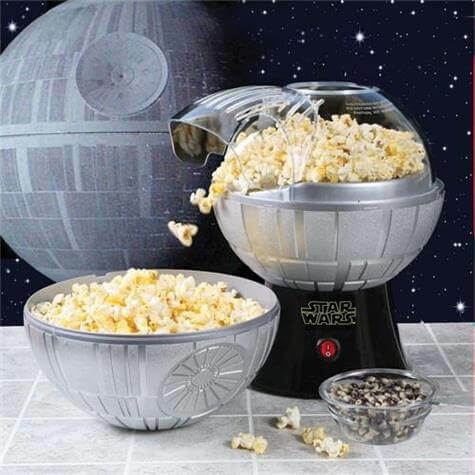 Star War fans will feel the power of Death Star every time they use this fun Star Wars themed Hot Air Popcorn Maker to enjoy fresh, delicious popcorn. Perfect gift and snack for them to watch their favorite Star Wars film. 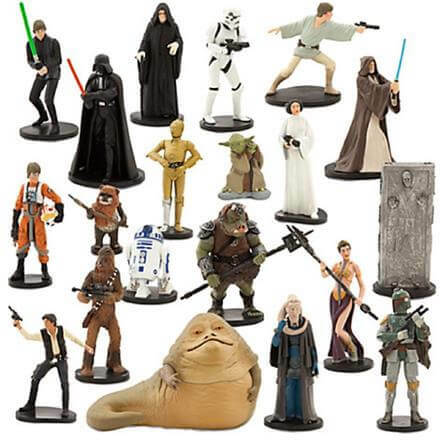 The Force will be strong with this Star Wars Mega Figure 20 Piece Play Set. This 20-piece set includes all the major Star Wars characters, including Princess Leia, Darth Vader, Han Solo, Luke Skywalker, and more. 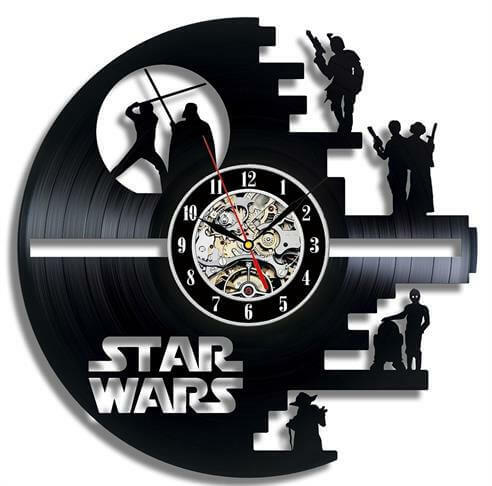 This Death Star Wall Clock is super cool because it is made of old used vinyl record with sophisticated workmanship! It is not just a wall clock, it is a piece of art. This clock makes an incredible and unique gift for your Star Wars friends! Star Wars fans who travel a lot will be thrilled by this super soft plush Darth Vader Gift Set. 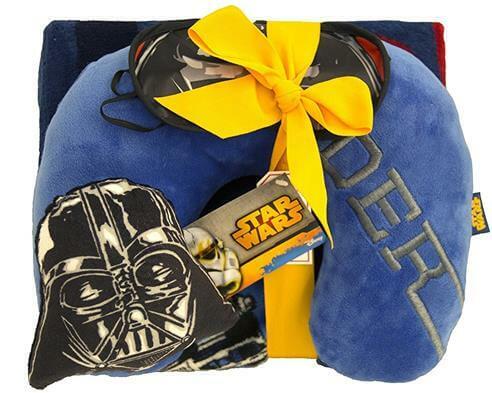 This 3 piece set includes a Star Wars themed comfy throw, a Vader applique neck pillow, and sleep-friendly eye mask. 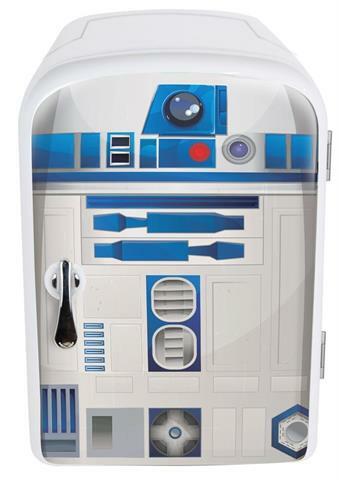 This fun and adorable R2-D2 mini-fridge holds up to six cans of beverage and has a hot/cold function and a carry handle. Put this cute Thermoelectric Cooler into your room and let it help you fight the dark side. 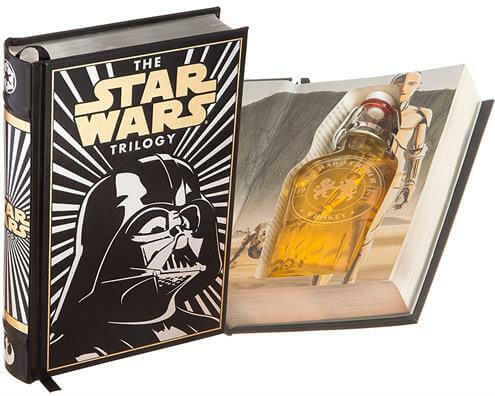 If the Star Wars geek you need a gift for is obsessed with whiskey, then this is exactly what you need to give them. This awesome leather-bound book has been hollowed out to fit an 8.5-ounce pocket flask perfectly. Add custom etching to the flask to make one of the best-personalized Star Wars gifts. This funny Star Wars Rogue One Stormtrooper Mug holds 22 Ounces of hot coffee, juice, beer, wine, or any beverages! It’s in 9 inches tall and is made of ceramic with a lid. Highly collectible but yet functional and practical. 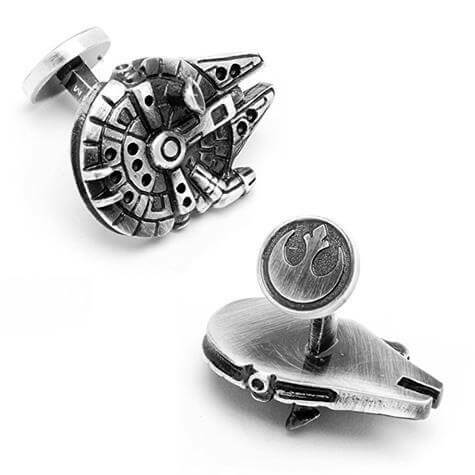 These 3D Star Wars Millennium Falcon cufflinks are the coolest gift for any Star Wars enthusiastic. Crafted in 3D and designed with gorgeous details, you can’t go wrong with this antique battle-worn ship. 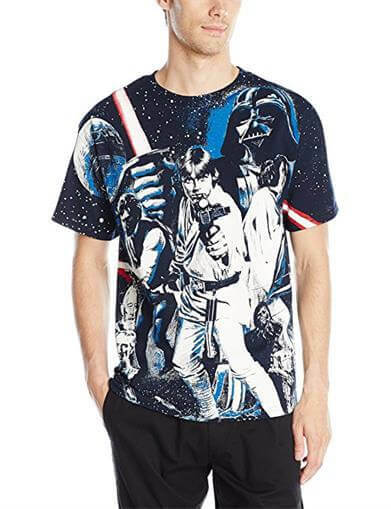 Let’s help Princess Leia and Luke Skywalker fight the dark side with this Mad Engine Men’s War Of Wars T-Shirt. Best of all, the back of this amazing T-shirt glows in the dark! Perfect for any HUGE Star Wars fan who dreams of going to a galaxy far, far away! 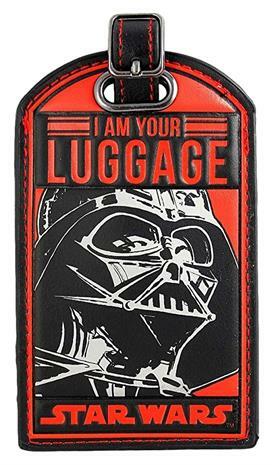 The Force is with your Luggage! This Star Wars I Am Your Luggage Darth Vader Luggage Tag is made of a vinyl type material and with a place to write contact information. 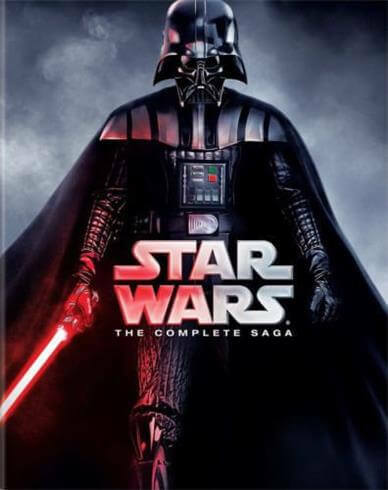 This Complete Star Wars Saga features all six Star Wars films utilizing the highest quality picture and audio presentation. In addition, it includes multi-angle story and board deleted/extended scenes. Fight with the dark than 40 hours! 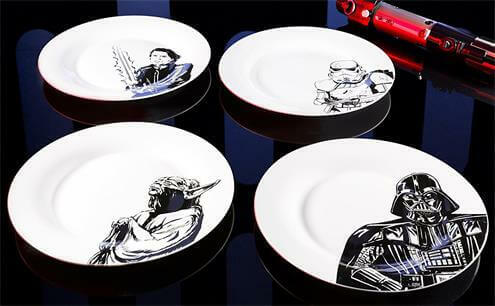 Bring a Star Wars favorite from the galaxy to the table with these stylish Star Wars plates set, featuring classic images of Darth Vader, Stormtrooper, Luke Skywalker, and Yoda. It is made of ceramic and BPA-free. Because it is Star Wars, the power of good taste is with you! 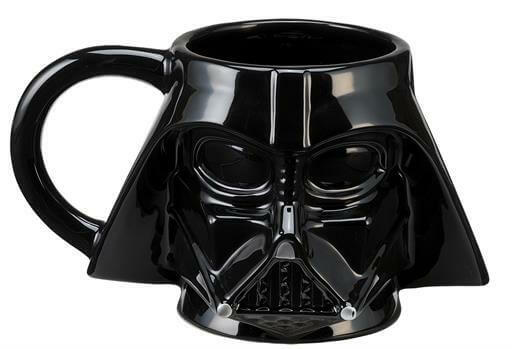 If you’re looking for affordable Darth Vader gifts for your Star Wars friend, this cool Star Wars Darth Vader Sculpted Ceramic Mug is one of the great choices. It is microwave safe. 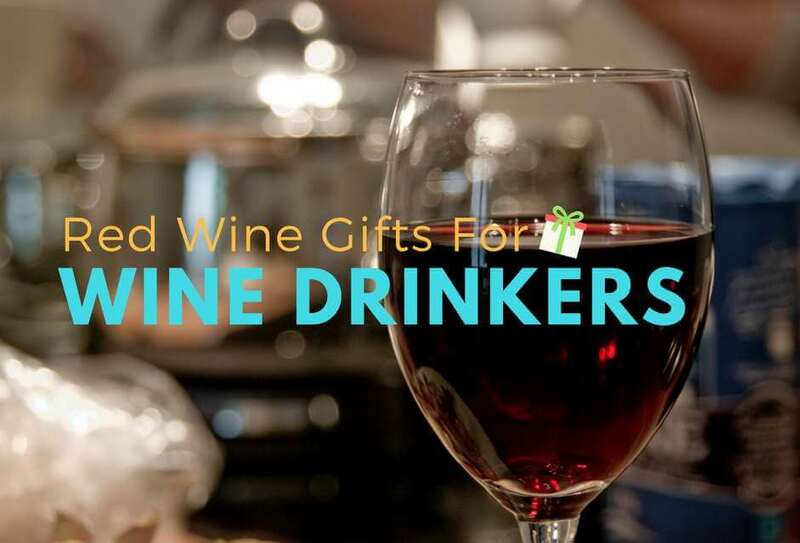 What’s more, it comes with a full-color gift box. The 2 products that particularly stand out to me are the statues with the dirt on R2 D2. Thats a realistic way to show off the battles that were won. Also the neck tie is such a subtle way to portray the dark side, oh and how about father of the year. Thats a real killer. Great job on the photos, and showing where they are available to buy. We’re happy that you like our picks! Your comment is highly appreciated. YES!! 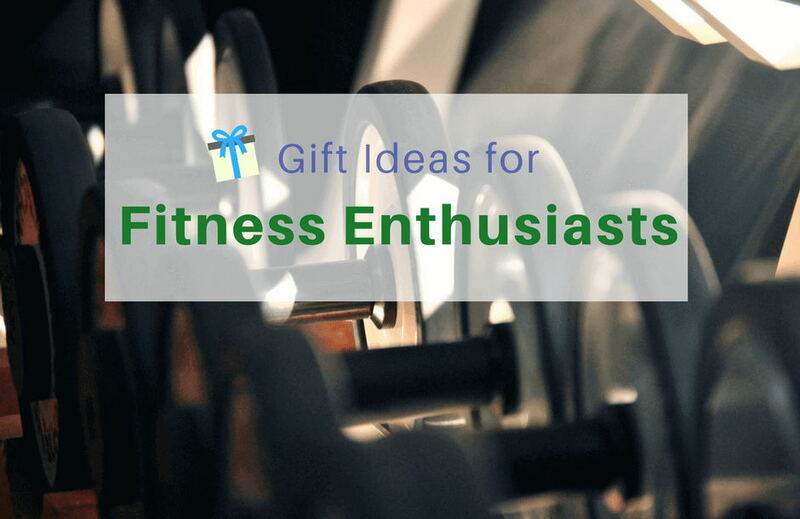 I freakin love this site…I have a ton of men in my family, and we all still do Christmas gift exchanges and birthdays….and it’s always a struggle because even tho I pride myself on being a thoughtful and creative gift giver, there DOES come a point when it’s hard to be creative! especially for men who have literally everything…I will definitely be consulting this site for the upcoming holidays! Thank you for the comment and feedback. We’re so happy that you ‘ve found our website useful. 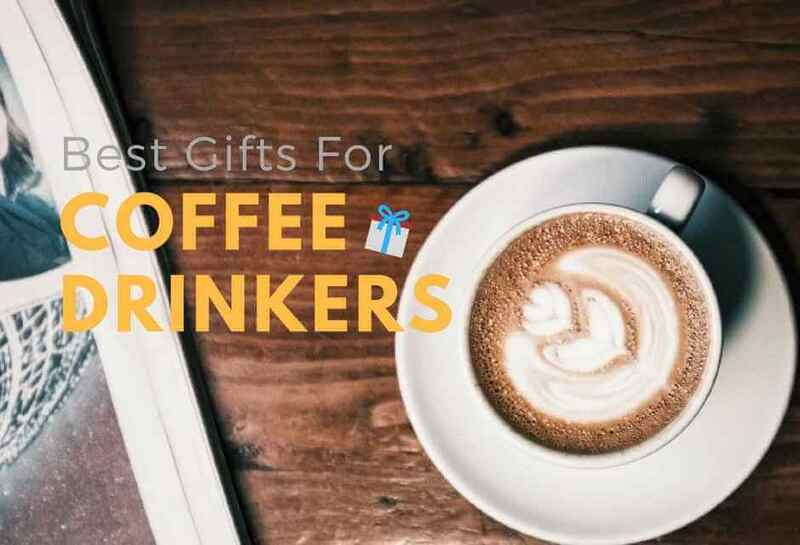 I can’t believe how many awesome gift ideas you have listed here! Just awesome! I think the This Death Star Wall Clock and the Nixon Men’s Vader Black Stainless-Steel Quartz Watch are really beautiful. By the way is the Watch water resistant? I also like the Star Wars themed Hot Air Popcorn Maker for my son. Great site, Thank you! 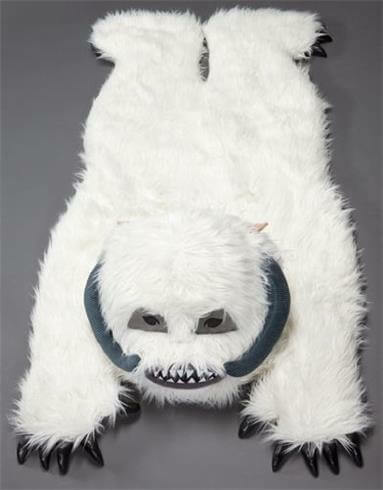 We’re happy to know you like our ideas for Star Wars Gift. 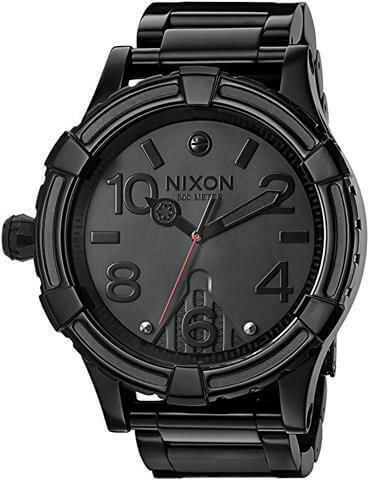 Yes, the Nixon Men’s Vader Black Stainless-Steel Quartz Watch is Water Resistant 300m (660ft).